The best way to reach us in a way that we can guarantee to respond in a timely manner is via email at info@westsidecjl.com . We will do our best to respond within 2 hours during normal business hours. Batya’s Kitchen – Upscale Passover cuisine. 4 course Dinner. We have a very eclectic crowd of people of all ages and levels of observance. Families, elderly and singles are welcome. Is the Seder wheelchair accessible? Yes – The West Side CJL is a branch of Chabad of the West Side. Seders will be led by Rabbi Mendel Groner. The Seder ends roughly 3 1/2 hours after it starts. First night 10:45 PM. Second night 11:30 PM. Please understand that this is an approximation. No. The seders will be conducted in a manner that people who speak hebrew and english can participate and understand. Will the Haggadas be in Hebrew only? The haggads will be english and hebrew bilingual. 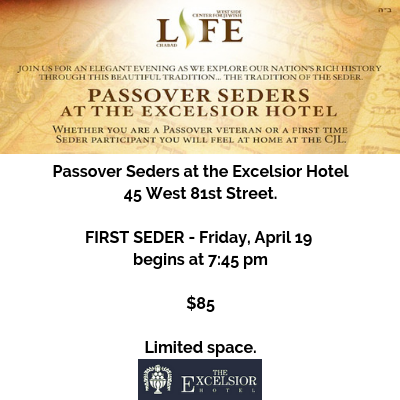 Can I call the Excelsior Hotel to make a Seder reservation? No. The only way to reserve is online via our signup page. Yes. You can send a check made out to West Side CJL – 219 West 81st St. #4A New York, NY 10024. We must receive the check before Monday April 10, by the end of the day. Please include your name and the names of your guests. And a good number or email address to reach you to confirm your reservation.